Each week, we are introducing a new chart on one of the Four C’s of Diamonds. This week, we kick it off with an analysis of diamond Clarity! Most people think the clarity of a diamond simply means how clear it looks. Though this is essentially true, there’s more of a science to it than that. Clarity actually refers to a precise measurement of the number of defects a diamond has both inside and on the surface of the diamond. Inclusions – (Also called “internal characteristics”) The imperfections inside the diamond. Usually these are difficult to see with naked eye. Blemishes – The imperfections on the diamond’s surface, such as a crack. Why do the experts deem a diamond’s clarity as important? Well, the fewer flaws a diamond has, the more rare it is in nature. The Gemological Institute of America (GIA) has a specific grading system for diamond clarity. When diamonds are graded for clarity, they are magnified at 10x power and the gemologist examines prevalence of inclusions and blemishes. Diamonds with the worst clarity are called “included” and those with the best clarity are the extremely rare, “flawless” diamonds. 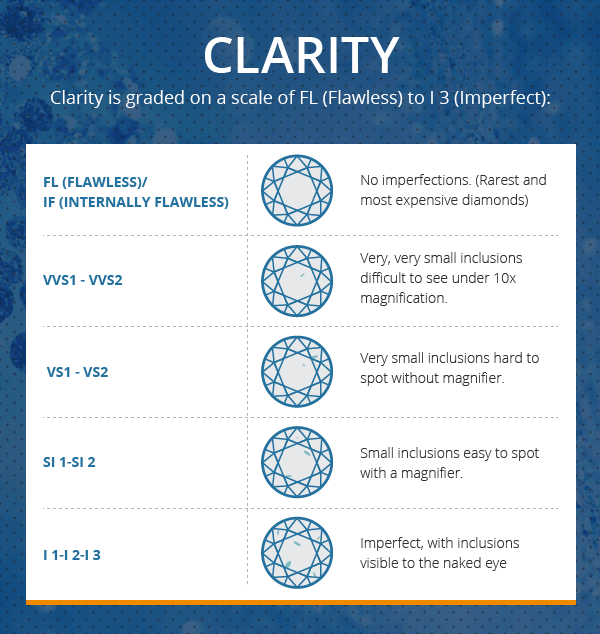 Flawless – The best diamond clarity grade a diamond can receive. It denotes the diamond has no internal or external flaws; the diamond is perfect. I3 Diamonds – (Also called “Included Diamonds”) the lowest clarity grade a diamond can receive. It denotes that the diamond has many visible inclusions and blemishes that can be seen with the naked eye. Our Diamond Clarity Chart below to see the full range of grades assigned by the GIA. 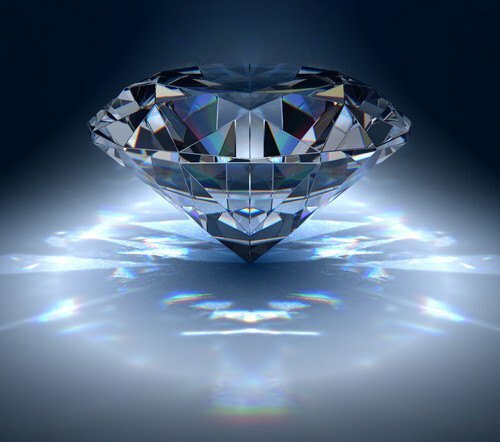 High-Clarity Diamonds Appreciate in Value – Diamonds with a grade of VVS2 or higher are more likely to appreciate in value, whereas diamonds with lower grade clarity (Lower than VVS2, often called fashion jewelry), usually do not gain value over time, but they are still fun and look great! Don’t Make Clarity Too Important – In actuality, it is nearly impossible to tell the difference between a flawless, a internally flawless, and a very very slightly included diamond with the naked eye. It’s often even difficult for the professionals to tell the difference under magnification! As such, we wouldn’t advise buying a diamond solely on the fact that it’s been given a “flawless” clarity grade, unless it is a larger diamond, you have the budget, and/or you want to invest in the diamond. Finally, not All Inclusions Are Bad! Because they are so unique and specific to a diamond, often times inclusions are used to authenticate gems. They make the diamond distinctive, unlike any other. There’s romance in that notion. So don’t turn away a beautiful diamond simply because someone tells you it’s flawed. Sometimes it is that flaws that make it special! Whether you choose a diamond for it’s perfection or it’s personality, a diamond’s clarity is part of it’s charm. You can shop for diamonds by clarity on Brilliance.com today!